Nickelodeon’s 90s era television programming has been referred to as the “golden age” of game shows. Millennial audiences grew accustomed to watching their favorite teen-focused game shows, like “Legends of the Hidden Temple,” “Double Dare,” “Nickelodeon Guts,” “Nick Arcade,” and “Wild & Crazy Kids,” not even including the diverse lineup of cartoon shows as well. These shows featured heavy product placement for things like moon shoes, televisions, game consoles, and other highly-desired products for the target audience. In this post, I’ll examine the current TV programming landscape and how it fails to attract Millennial viewers, particularly with Nickelodeon’s brand new, Millennial-focused “The Splat” using social data along with other outside sources. 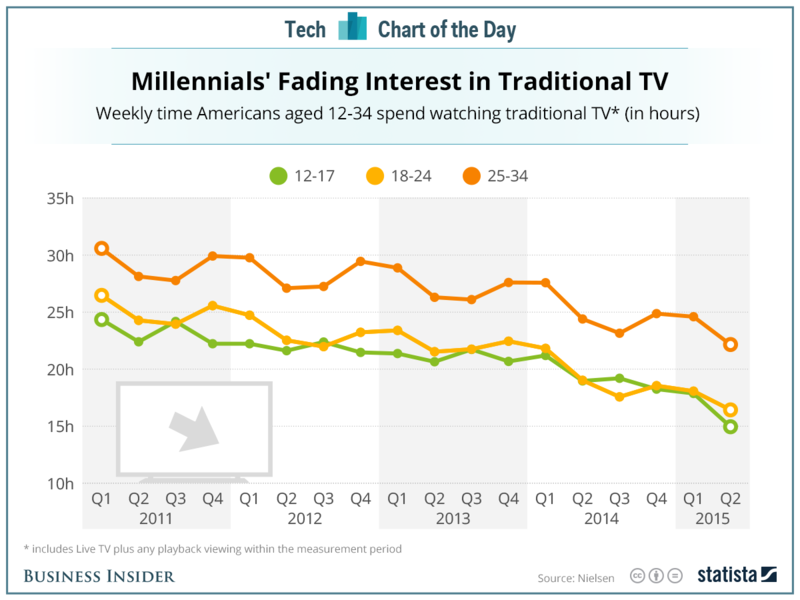 Historical Nielsen data, as charted by Statista for Business Insider, suggests that teens and millennials are spending increasingly less hours watching “traditional,” or non-time-shifted TV. Instead, they’re choosing recorded programming via DVR they can watch later, video-on-demand services like Netflix, Hulu, or user-generated content sources like YouTube instead. Facebook reports a similar view concerning the increasing focus on driving user engagement among these particular demographics. In a post about CPG product discovery, they outline an interesting example of why product discovery trends are shifting among these crucial groups of TV viewers. Other groups spend far less time researching products online before buying than either Millennials or US Hispanics. Facebook found it was easier to engage millennials for advertising targeting by combining focused efforts across multiple channels, including their own advertising network. Only 12.2% of millennials can be reached by TV-only campaigns, versus only 14.2% of millennials who are reached with only Facebook targeting. When Facebook advertising is combined with traditional network TV strategy, however, marketers are able to exponentially improve their efforts, moving the needle to 69.3% of millennials within their reach. Similarly, 16.3% of U.S. hispanics can only be reached on TV, vs. 17.5% only on Facebook. Engaging these users across multiple channels, however, dramatically increases marketers’ reach, finding 61.2% of Hispanics using a combination of Facebook’s ad targeting in addition to more traditional TV network ad strategies. As a former millennial Nickelodeon game show addict, I remember being enthralled by the incredible array of products seemingly tailored towards trending product launches at the time. If it hadn’t been for Nickelodeon’s game shows, I might never have found out about so many products.. But Nickelodeon’s current strategy is not about product discovery or a particular CPG focus, it’s about recapturing the nostalgic Millennial audience with overtures toward their earlier years. Looking at data since January 1, 2014, Nickelodeon experienced an all-time high in public sentiment response since the announcement and subsequent launch of their all-90’s programming block, “The Splat,” airing between the hours of 10pm and 6am, using otherwise maligned programming time on Nickelodeon channel Teen Nick. While traditional TV networks have been suffering among different demographic groups, some recovering quite recently, Nickelodeon’s social media demographics seem evenly quite evenly split and indicate a trend of continued Millennial support. AdAge reports that a “year ago, young women began disappearing from broadcast’s radar, and while the numbers for week one [this year] weren’t exactly encouraging, there appears to have been some improvement since the season began.” Women 18-to-34 were down ten percent in week one, the declines softened to minus-five percent in week two. Similarly, women 18-to-24 was down thirteen percent during the first week of the season, improving to minus-six percent a week ago. Male viewers 18-to-34 were down fifteen percent in week one, continuing to minus-thirteen percent the following week. Male viewership 18-to-24 dropped nineteen percent during this year’s premiere week and remained low at minus-eighteen percent the week after. Social analysis suggests that among Nickelodeon’s “The Splat” viewers, however, most of which are Millennials, demographics remain evenly split. With more and more services launching that offer video-on-demand, it seems that traditional network TV is struggling to engage the Millennial audience. Network executives must learn from the popularity of streaming media to determine which programming choices work. Nickelodeon’s “The Splat” seems like a millennial silver bullet with traditional cartoon favorites from the 90’s, but will it work? 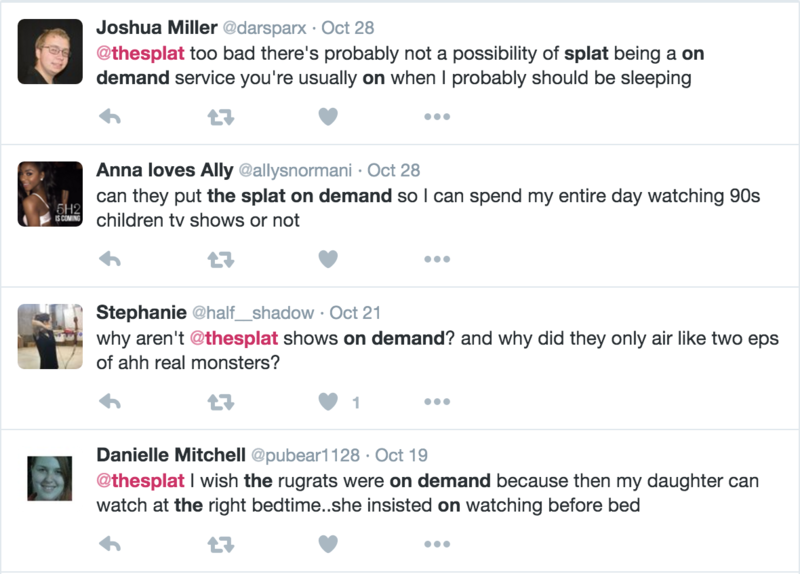 Based on the historical data available, as well as current TV engagement trends, the success of “The Splat” seems to rest tenuously on whether or not the evening timeslots are going to be enough to reach millennial viewers. Interestingly, there is currently no video-on-demand option for “The Splat’s” 90s programming. While Millennials seem to favor these viewing options, topic responses in discussion concerning Nickelodeon’s 90’s offering remain overwhelmingly positive. Traditional network TV struggles to keep millennial viewers tuned-in to much of their current programming. Most networks have given in to consumer preferences, either choosing to license their content to already-existing on-demand services like Netflix, Amazon, or Hulu, or launching their own service, as CBS has with CBS All-Access. While networks make content decisions increasingly backed by millennial marketing data, the popularity of streaming services may mean that Nickelodeon’s 90’s block will end with a ‘splat’ of its own. Again, as a millennial, I have to ask: If Nickelodeon executives are willing to resurrect my favorite 90s shows for time slots I won’t be awake to watch, why won’t they give me “Legends of the Hidden Temple” on-demand? Nickelodeon has piqued the interest of Millennials fans across the US. Early warning signs, however, point to trouble ahead for their 90’s programming block with no on-demand options.